The U.S. Air Force Special Operation Command's CV-22 Ospreys have been at the Yokota Air Base near my house since April 5, 2017. The mission of these aircraft is assassination, abduction and destruction of enemy personnel and facilities. They are not cargo aircraft. I frequently see them flying around with the backend open (the loading ramp). Some of my photos show only two people there, but some of my photos show an M2 (12.7 mm) machine gun pointing out the back and bent down toward the ground below. The ground below is a dense urban area filled with houses, schools, hospitals and many other things, including my house. Would the U.S. Air Force be allowed to do this in the U.S.? 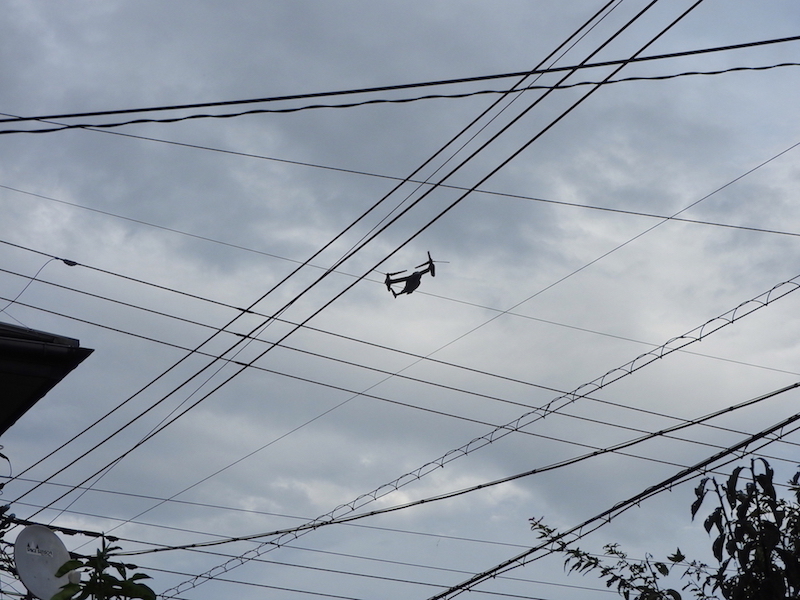 CV-22 Osprey flying over my neighborhood with the backend open (August 16, 2018, 16:49). Photo taken from my front door. CV-22 Osprey pair lifting off the runway with the backend open (July 18, 2019, 14:05). 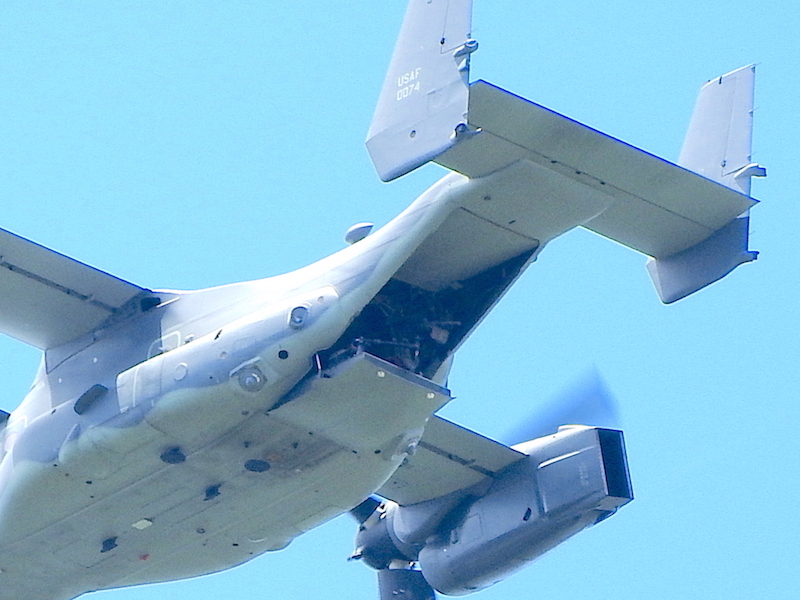 CV-22 Osprey with backend open and an M2 (12.7mm) machine gun showing (June 29, 2018, 11:55). One of two flying together going south toward downtown Hachioji City. They lifed off Yokota Air Base at 11:50. Only one of them had the machine gun showing. CV-22 Osprey pair right after lift-off (November 7, 2018, 15:43). CV-22 Osprey #0074 going past me with backend open and an M2 (12.7mm) machine gun visible. The other Osprey also had the machine gun showing. 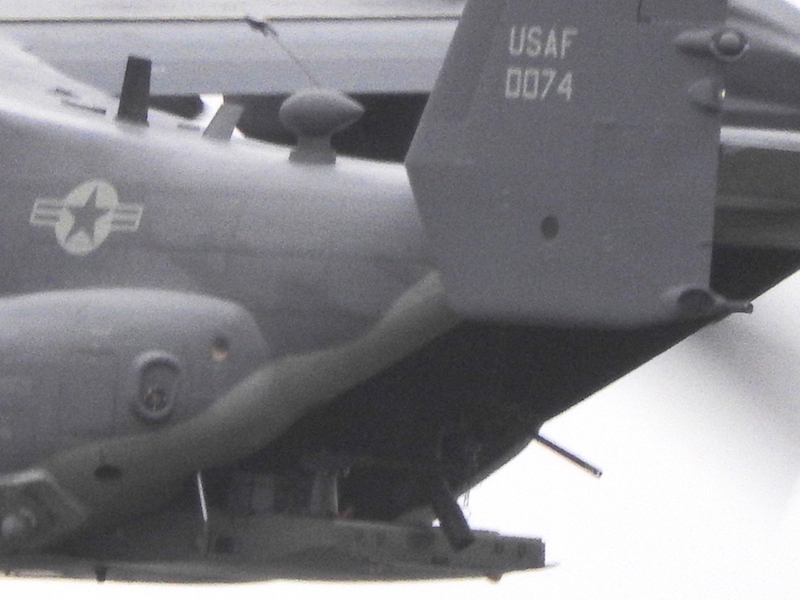 CV-22 Osprey close-up showing machine gun more clearly. 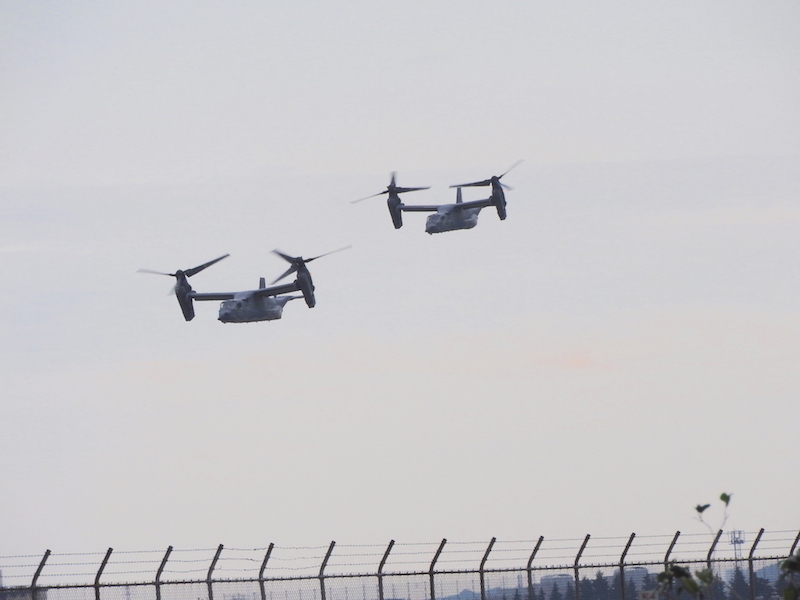 Since their arrival at Yokota Air Base last April, these CV-22 Ospreys have been recorded 17 times flying around over the local urban area with the M2 (12.7mm) machine gun hanging out the backend. One time in June, 5 times in July, 3 times in August, 5 times in November, and 1 time in January this year, and 2 times in March. The one in January (on the 4th) was also photographed at Misawa Air Base in northern Japan with the M2 (12.7mm) machine gun hanging out the backend (Aireview April 2019). It was at Misawa for training. 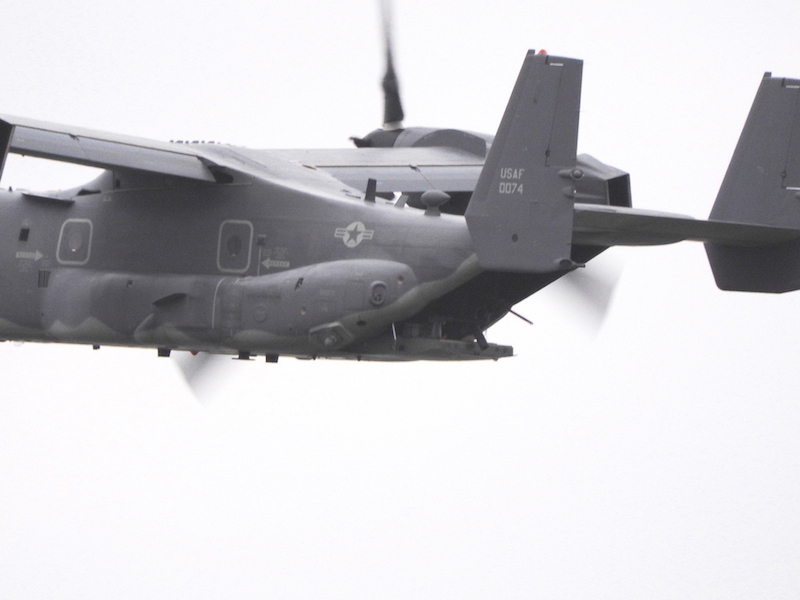 The caption with the photo says this CV-22 Osprey belongs to Det. 1, 353 Special Operations Group. The local people have never been informed of this. They learned it by observing the aircraft. Would the U.S. Air Force get away with this in the U.S.? 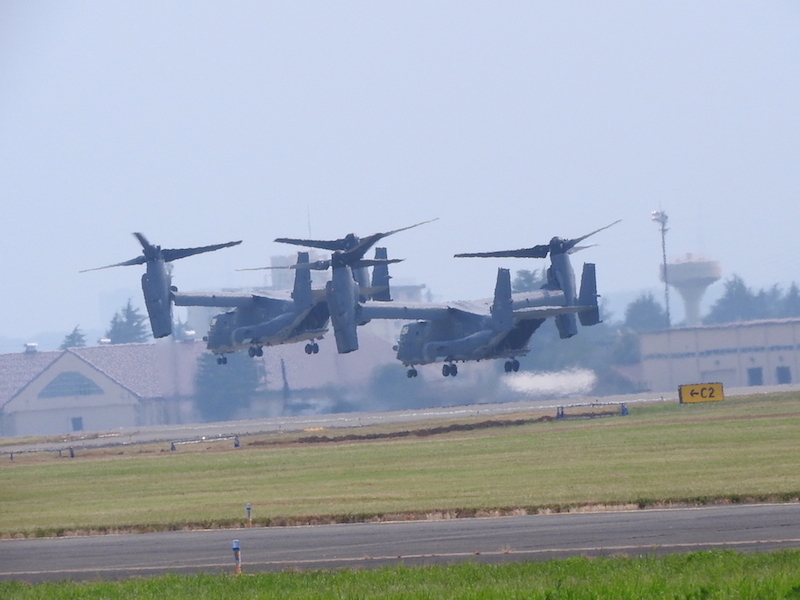 The deployment of the CV-22 Ospreys to Yokota Air Base was originally scheduled for 2017, but that was delayed to 2019 shortly after the announcement. Then, at the beginning of April last year (2018), the local people around Yokota Air Base were told that the deployment to Yokota Air Base had been advanced to April 5th, a few days later. By the time of that announcement, the CV-22s had already been seen being unloaded at the dock near Yokohama. The advancement in their deployment could no longer be kept a secret. Would the U.S. Air Force get away with that in the U.S.? The Japanese government had been told of this advancement in the deployment about a month earlier, in March, but it did not tell its own people. It supported a foreign military instead. Would the U.S. government get away with something like that in the U.S.? Yokota Air Base officially is a transport base: cargo and passengers. But the CV-22 Osprey is a front-line attack aircraft. Stationing these aircraft at Yokota Air Base violates this official explanation of the base's mission. Further, the U.S. military started parachute training at Yokota Air Base in 2012. This is another violation of the official explantion of the base's mission. Would the U.S. military get away with something like this in the U.S.? The book by Aoki, listed below, is a very good book. Aoki is one of Japan's leading military journalists, and he very likely is the best one on the V-22 Ospreys. He is very thorough and objective. He likes the V-22 Ospreys, but he discusses their flaws and weaknesses fully. His book is very useful to both those who support the V-22 Ospreys and those who oppose it. I oppose it. Among many other reasons, I disagree with the CV-22 Osprey's mission. I also think it is much too complicated. I have talked to an MV-22 Osprey (Marines) pilot and a local C-130 pilot (and I have about 1,000 hours flying time on the C-130). I asked both of them the same question: "In very tough competition, which aircraft would win?" They both agreed (the C-130 pilot emphatically) that the C-130 would win. The V-22 cannot compete with the C-130. Most people grossly under-estimate the capabilities of the "ugly duckling" C-130. Aoki Yoshitomo, V-22 Ospreys: The Complete Textbook (in Japanese), 2019.